Home » Cover Story » 3 In 4 Indian Women Don’t Work. Can Skilling And Guaranteed Jobs Change That? I read this article and found it very interesting, thought it might be something for you. The article is called 3 In 4 Indian Women Don’t Work. Can Skilling And Guaranteed Jobs Change That? and is located at https://archive.indiaspend.com/cover-story/3-in-4-indian-women-dont-work-can-skilling-and-guaranteed-jobs-change-that-38932. Female garment workers at an assembly line at a factory in Bengaluru. 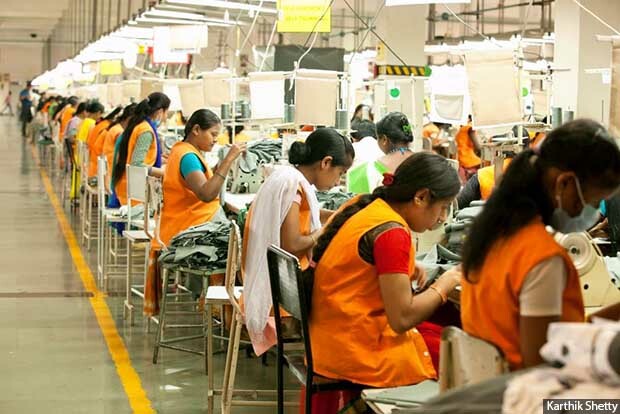 The garment industry may hold the potential to unlock female labour supply in India as it creates 8.2 female jobs per Rs 1 lakh investment, according to the latest Economic survey. Gulbarga, Karnataka: It’s 6.30 p.m. A woman whom we shall call Nirmala brings out a plate and a blunt knife from her kitchen. It is time for the experiment. Nirmala divides some uncooked rice, Mysore pak (a sugary sweet, considered a luxury in regional households) and an apple among her family of five. When asked what order she would serve these items in, she says she would serve her husband first, then her son, then grandson, then herself, and finally, her daughter-in-law. The portions follow the same order–the largest is reserved for the husband and the smallest for the daughter-in-law. Nirmala’s days, like those of many other women in her village of Balwad, are spent labouring in agricultural fields during the sowing season, and unemployed at home for the rest of the year. While food consumption and household expenditure patterns indicate that additional sources of income would be welcome, several constraints hold women back from entering the formal workforce. A little more than half (54.4%) the surveyed households reported a woman member working outside the home in Participatory Rural Appraisals (PRAs) conducted by worker welfare non-profit Good Business Lab in January 2017 in more than 1,300 villages across 53 taluks (sub-divisions of districts) in Karnataka. The primary activity for 57% of these women was work on the family’s farm. When girls and women earn, they invest 90% of it in their families and communities, according to the World Food Programme. But is it possible to identify and influence the relation between getting women to work and changing the distribution of food in Nirmala’s home? The Good Business Lab (GBL), based in Bengaluru and New Delhi, works to evaluate and inform interventions that enable worker welfare as well as business returns. Under the guidance of its co-founders and Chief Research Officers Achyuta Adhvaryu (University of Michigan) and Anant Nyshadham (Boston College), GBL is investigating the impacts of technical skilling and jobs in the garment industry on female labour force participation, women’s time use, and the welfare of women and their households (Read part 1, part 2, part 3, part 4, part 5, part 6, part 7 and part 8 of IndiaSpend’s nationwide investigation on why women are falling off the employment map). By setting up 10 garment-sector skilling centres for women at rural locations chosen randomly, our study aims to inform the skilling and job creation policy at the national level. Why don’t more Indian women work outside the home? The female labour force participation (FLFP) rate in India has fallen from 36% in 2005-06 to 24% in 2015-16, as per the Economic Survey of India 2017-18. Female workers are highly disadvantaged in the labour market–they are in large part low-skilled informal workers, engaged in low-productivity, low-paying work. India’s gender gap in median earnings of full-time employees is larger than in South Africa, Brazil and Chile, meaning most women earn far less than men in India than in these countries. Why is the FLFP rate so low, and what explains the fall in the past decade in an economy that has been expanding rapidly? Conservative social norms, lack of awareness and mobility constraints are a few of the evident reasons. In GBL’s participatory rural appraisals, women reported spending nearly two hours cooking on a typical day while men spent less than half, 52 minutes. At a macro level, Indian men on an average spend around 50 minutes per day doing unpaid work, as opposed to Indian women who spend nearly six hours, according to OECD estimates. Our data further show that the gender imbalance persists in other spheres of life, such as taking care of children, participating in village politics and even surfing the internet. Further, if the woman of the house is not present, in two-thirds of the cases the responsibility of cooking, cleaning and child care shifts to the mother or mother-in-law. Only in around 22% of the cases does the husband take it up, and in 5% of the cases the father or father-in-law steps in. In other words, women do not work at paid jobs because they do not have the time. The other common challenge women face is a lack of agency and mobility constraints. According to our data, only 17% of women reported having land registered in their names. Just 16% reported migrating to the city for work, and only 5% did so alone. This is also reflected in data from the Indian Human Development Survey (IHDS) 2012, in which out of the 34,000 women surveyed across 34 Indian states and union territories, 80% said they needed permission from a family member to visit a health centre. In our field visits we have encountered various women who said their male family members used the time constraint argument as an excuse to keep them at home. When women work on family land, the money is still controlled by the husband. We have often met women who could not travel alone–they always needed to be accompanied by a male family member. Only 5% of women in India said they had sole control over choosing their husband, as per IHDS 2012 data. Early age at marriage and childbirth has also anecdotally emerged as a challenge to women joining the workforce. In our data, the average age at marriage for women is 18.5 years, with the minimum–16 years–falling below the legal age; and the maximum 23 years. From our experience of talking to young female garment workers, women dropping out within a few months of starting work to get married is not uncommon. What is more, women who do manage to stay on after marriage drop out after childbirth, being unable to manage professional and domestic demands at the same time. In our data, the average age at the time of childbirth is 20.5 years, with the maximum being 25 years. India’s huge labour force is second only to China’s. However, 90% of India’s workforce is not formally trained, as against 47% of China’s. The Skill India initiative aims to enhance employability and create jobs. Currently, Skill Development Programmes (SDPs) are being implemented by some 22 ministries and departments of the central government. The draft New Education Policy (2016) proposes to integrate skill development programmes with the curricula of 25% of schools and higher education institutes. But where does the gap between skilling and employability lie? Fully 63% of the Employability Skill Test takers (below 30 years) are employable, the India Skills Report 2016 by the online talent assessment company Wheebox found. However, 58% of unemployed graduates and 62% of unemployed postgraduates said the main reason they were jobless was because there were no jobs available to match their skill and education levels, as per the Employment and Unemployment Survey (EUS) 2016 by the Labour Bureau. During our own visits to rural areas we met women who, having undergone training in sewing, had no idea what to do with this new skill as the village was saturated with tailors. India needs 100 million skilled workers by 2022 but the unemployment faced by skilled job-seekers paints a bleak picture. For instance, in 2016-17, over 160,000 persons were skilled under the Deen Dayal Upadhyaya Grameen Kaushalya Yojana of the central government; only half were placed. We tested the presumption that creating more jobs for women in the garment industry–where women already constitute 35% of the workforce–and retaining them in these jobs, might provide a solution. The textiles and apparel sector employs over 119 million directly and indirectly, making it the second largest employer in India. The apparel industry model holds the key for India’s job creation requirements, according to Arvind Panagariya, ex-chairman of NITI Aayog and professor at Columbia University. This sector presents an opportunity to close the gender gap in economy-wide employment in India, as evident from the table below. Our previous research demonstrates that training low-income female garment workers in soft skills empowers them with greater financial agency and bargaining power in the workplace and at home. In Bangladesh, female education, total fertility rates and women’s labour force participation improved due to the expansion of the apparel sector. How can this sector become a vehicle of social and economic transformation in India? Our intervention, in collaboration with Shahi Exports, the largest garment exporter in India, is unique in that in addition to providing skills training, it also guarantees a job after the training is complete. Further, we are carrying out psychometric personality testing to understand what characteristics make workers more likely to take up and remain in jobs. Currently, the baseline survey is being rolled out in 20 taluks in Karnataka and Andhra Pradesh. From Shahi Exports’ perspective, a major industry-wide challenge is retaining labour, especially migrant labour. The first six months are the most crucial in determining who stays on in the job and who does not, they say. Thus, we are also looking at mechanisms to generate better self-selection into the programme so that people who sign up are likely to stay on, as well as to identify vulnerable groups that may benefit greatly from the job. This project hence realises the role of the employers in not just skilling and employing people, but also retaining workers, thereby generating insights that can have sector- and economy-wide implications. Through our experiment we want to see how training and employing a woman does not just generate additional income but has spillover effects on her family and community. Does it change a woman’s time-use pattern and alter the gendered nature of household tasks? Does she actively take part in decisions regarding household education expenditure? How is her household bargaining power with respect to fertility decisions affected? Does her family members’ perception of women in general change? Are women who take-up the job, and stay at the job, intrinsically different in their psychometric characteristics from those who don’t? Ultimately, does the order and quantity of food distribution in Nirmala’s household, if she takes up the migrant employment opportunity, change? This is the latest in an ongoing nationwide IndiaSpend investigation into India’s declining female labour force participation. You can read the series here.